Twice in the last 30 days we have gotten calls from attorneys who are representing trustees being sued by disgruntled beneficiaries. The fact patterns for these two projects were almost identical–single digit performance by the trust in 2017, high performance from the S&P 500 during that same period, beneficiary finds a trial lawyer with little trust experience to take the case on contingency, the claim states that the low performance of the trust relative to the “market” is evidence that trustee managed the assets imprudently and justifies the beneficiary’s request that the trustee be surcharged, removed and replaced with a beneficiary-selected trustee. What we found was that (1) given the trust purpose, terms and distribution requirements, the trustee established a “moderate” risk and return mandate, (2) the trustee prudently delegated investment management functions to a qualified advisor, (3) the trust assets’ performance in 2017 was consistent with the “moderate” risk and return mandate, and (4) comparing the trust performance to the “market” (as represented by the S&P 500) was an inappropriate comparison, and finally (5) the trustee can only be surcharged and removed for acting imprudently and in bad faith and no such evidence had been presented. As you can see, it is fairly easy to cut apart these “relative return” complaints from disgruntled beneficiaries and their contingency litigators that represent them. But the trustee and their attorney had to invest a considerable amount of time and money to convince the beneficiary and their attorney that there was not liability. Wouldn’t it have been better if at the very inception of this argument, the trustee had in their compliance file a complete record of their central duties of care, the policies that they have adopted as trustees (a “Fiduciary Governance Statement”) and supporting documents for the governance procedures that were conducted during the year? This level of detail, delivered to the disgruntled beneficiary BEFORE they went to an attorney or before the attorney filed the complaint could have prevented this entire mess before it started. There are two reasons to establish and execute a series of governance procedures. 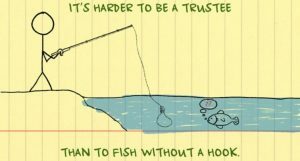 First, it’s what good trustees do, and second, doing so helps trustees rebut the claims of disgruntled beneficiaries.